Referred to as the “Mother of all churches in the world”, the Basilica of St. John Lateran constitutes the perfect linkage between the pagan and Christian eras. Created, in fact, for public meetings and administering justice, with the spread of the new faith it was turned into a imposing ecclesiastical building, capable of welcoming a large congregation. Behind Alessandro Galilei’s eighteenth century façade lies Borromini’s magnificent interior, commissioned by Pope Innocent X for the Jubilee Year in 1650. The whole five nave-structure has survived well-preserved through the ages, as indeed has the sumptuous sixteenth century coffered ceiling gilded with real gold in the central nave. Your stay should now continue with a visit to the museum, where a number of precious liturgical artefacts are kept, as well as to the cloisters, a masterpiece of the Cosmatesque style where relics of the architecture, sculptures and decorations of the ancient basilica are exhibited. Our first glimpse of U.S. Architect Richard Meier’s Church “Dives in Misecordia” appears to be that of a ship in full sail. The three great blazing white 26 metre concrete sails are said to symbolically allude to both the early Christian image of the soul which, like a ship, navigates towards Christ, and to Pope John Paul II’s historic interpretation that they represent the Church ferrying believers to face the third millennium. Inaugurated in the working class Roman district of Tor Tre Teste in 2003, the glowing white of this jewel of contemporary architecture is unlikely to alter thanks to a new cement whose formulation assures the intense colour will resist the test of time. The Basilica of St Paul Outside the Walls is one of the four papal basilicas of Rome, the second largest after St. Peter’s. The church stands on the site which is traditionally believed to be the burial place of the Apostle Paul. The first Christians after his execution erected a sepulchral chapel, called a cella memoriae. This was subsequently turned into a basilica by the Emperor Constantine and consecrated in 394 by Pope Silvester I. The first reconstruction work, expanding the church, was completed in 395 A.D. under the Emperor Honorius. Historically one of the important stops on the pilgrims’ route, the cathedral’s current shape is the result of the work of Pasquale Belli and then Luigi Polleta who, assisted by other architects, rebuilt it between 1825 and 1854. Standing before us today was once the vast antechamber and the Tepidarium (the warm bathroom) of the Baths of Diocletian, which is quite evident from the eight huge granite columns, each measuring 14 metres in height and 1 ½ metres in diameter. On entering our attention is immediately caught by the double meridian on the floor of the transept: the sun, filtering from a hole placed to the right of the window above the right nave’s entrance, indicates the position of the Polaris or North Star and the precise time it reaches its zenith (midday). Unveiled by Pope Clement XI in 1702, it was used to check the accuracy of the calendar right up until 1846. 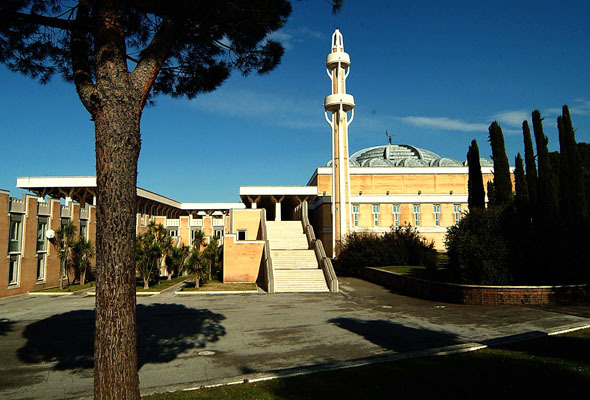 The Mosque of Rome , inaugurated in 1995, is one of the biggest in Europe. It is an very important reference point for Muslims living in the Capital. Built to a design by the architects Portoghesi, Gigliotti and Moussawi, it is located at the foothills of Monti Parioli and perfectly integrated with the surrounding vegetation. The structure spreads out for 30,000 m². the inside is characterized by a large pray hall that evokes the image of a forest due to the tri-stemmed columns that imitate the feature of the trees. The Mosque, also considered Italy’s most prestigious Islamic center, is not only a site for pray for Muslims on Fridays and during the Ramadan period, but also a place where to celebrate Islam rites weddings, where to accept conversions and where to give assistance to relatives of the Muslims who die in Italy, both to organize their funerals and to return their remains to their own Country. The Church of Santa Maria della Concezione of the Capuchins, which is more frequently referred to as Nostra Signora della Concezione, is undeniably among the most fascinating of the hundreds beautifying Rome. Located in the celebrated Via Veneto, it was built near Palazzo Barbarini by Pope Urban in honour of his brother Antonio Barberini. Himself a Capuchin friar, Cardinal Antonio Barbarini’s tomb is to this day preserved inside, in front of the main altar of this church, whose best-kept secrets are to be found below ground. This is an ancient temple built, converted into a church in the ninth century, overlooking the valley of the River Almone, today the Valley of the Caffarella. The building’s current look may be attributed to radical restructuring undertaken in 1934 during the papal reign of Urban VIII, who had a brick wall added between the columns (once part of a portico) as well as a bell tower erected on top of the roof. Originally it was a small prostyle temple, tetrastyle in brick, dedicated to the Emperor Marcus Aurelius, with four columns embedded in its façade and an architrave made of pentelic marble. The French National Church, founded by Cardinal Giulio de’ Medici (later Pope Clemente VII) in 1518, and completed in 1589 by Giacomo della Porta and Domenico Fontana is famous for three paintings by Caravaggio dedicated to St. Matthew and for the frescoes by Domenichino. The vast late-Renaissance facade, probably attributed to Giacomo della Porta, is divided by pilasters into five bays, with three doors and two niches with statues of Lestache (1758). The interior has three naves with five chapels for side and a rich central choir decorated with marble, the style of the whole church is undoubtedly Baroque. Its late Baroque external hides treasures dating back mainly to the Middle Ages: stand the ciborium and the floor of Cosmati, the magnificent schola cantorum and the mosaic of Roman school depicting the Triumph of the Cross; Masolino da Panicale left traces of his genius in the frescoes that decorate the Chapel of St. Caterina. It’s interesting visit to the lower church and its frescoes, one of which (the legend of Sisinnio) presents one of the first examples of Italian vernacular.